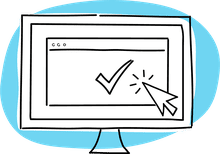 Hyperlinks connect one thing to another so that users can easily jump from one place to another with a simple click of their mouse. Because of how hyperlinks work, they appear as a colored link in MS Word; you can't see what they were built to do until you edit the link or click it to see what it does. Hyperlinks are used in other contexts, too, like on websites. The "Hyperlinks" text at the very top of this page is a hyperlink that points you to a page that explains more about hyperlinks. Select the text or image that should be used to run the hyperlink. The selected text will appear highlighted; an image will appear with a box surrounding it. Right-click the text or picture and choose Link or Hyperlink... from the context menu. The option you see here depends on your version of Microsoft Word. If you selected text, it will populate the "Text to display:" field, which will be seen as the hyperlink in the document. This can be changed here if needed. Choose an option from the left under the Link to: section. See below more information on what each of these options means. When you are finished, click OK to create the hyperlink. A few types of hyperlinks can be included in a Word document. The options you see in your version of Microsoft Word might be different than in other versions. What you see below are the hyperlink options in the newest version of MS Word. You'd use this option to have the hyperlink open a website or file after it's been clicked. A common use for this type of hyperlink is to link text to a website URL. Another use might be if you're talking about another Microsoft Word file you've already created. You can simply link to it so that when it's clicked, that other document will open. Or maybe you're writing a tutorial on how to use the Notepad program in Windows. You can include a hyperlink that immediately opens the Notepad.exe program on the user's computer so that she can get there without having to fumble around in folders looking for the file. Another type of hyperlink supported by Microsoft Word is one that points to a different place in the same document, often called an "anchor" link. Unlike the hyperlink from above, this one doesn't make you leave the document. Let's say your document is really long and includes lots of headings that separate the content. You can make a hyperlink at the very top of the page that provides an index for the document, and the user can click one to jump right to a specific heading. This kind of hyperlink can point to the top of the document (useful for links at the bottom of the page), headings, and bookmarks. Microsoft Word hyperlinks can even create new documents when the link is clicked. When making this type of link, you get to choose whether you want to make the document now or later. If you choose to make it now, then after making the hyperlink, a new document will open, where you can edit and save it. Then the link will simply point to an existing file (the one you just made), exactly like the "Existing File or Web Page" hyperlink type mentioned above. If you decide to make the document later, then you won't be asked to edit the new document until you click the hyperlink. This type of hyperlink is useful if you ultimately want to have new content linked to a "main" document but you don't want to create those other documents just yet; you just want to provide the links to them so that you'll remember to work on them later. Plus, once you do make them, they'll already be linked in your main document, which saves you the time it takes to link them later. The last type of hyperlink you can make in Microsoft Word is one that points to an email address so that, when clicked, the default email client will open and begin composing the message using the information from the hyperlink. You can choose a subject for the email as well as one or more email addresses that the message should be sent to. This information will be prefilled for whoever clicks the hyperlink, but can still be changed by the user before they send the message. Using an email address in a hyperlink is often how people build a "contact me" link that will send a message to the website administrator, for example, but could be anyone, such as a teacher, parent, or student. When the subject is prefilled, it can make it easier for users to compose a message since they don't need to think of a subject.